Are you looking for affordable lawn care in Irving, TX? Let GoMow experts help you with all lawn care service needs. Visit GoMow.com to get a FREE QUOTE for lawn maintenance. Residential Lawn Mowing in Irving, "You Click,We Cut"
Yes, we are mowing your street! GoMow is honored to offer lawn care and lawn mowing services to Irving residents. Click here www.gomow.com to select from one of the many different Lawn Maintenance Service Plans available to the residents of Irving and have GoMow maintain your lawn today! Irving is the thirteenth most populated city in Texas and is part of the DFW Metroplex. Irving includes Las Colinas, one of the first master-planned communities in the United States. Did you know it is home to the Mustangs at Las Colinas, which is the largest equine sculpture in the world? 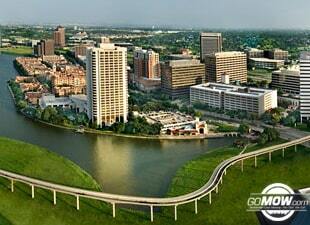 Many Fortune 500 companies, such as ExxonMobil, Kimberly-Clark and Fluor Corporation are located in Irving, Texas. Our full Lawn maintenance service in Irving includes lawn mowing, blowing, edging and weed eating of all turf areas. At GoMow, we are committed to servicing the residents of Irving with their various lawn service needs. We offer a variety of affordable lawn mowing and lawn care services. Contact www.gomow.com to help you get set up on an ongoing Lawn Maintenance and Lawn Treatment service plan in Irving today. Absolutely LOVE go mow! It is so easy to get started, super friendly and love the flexibility to mow weekly, bi-weekly or how ever often you need, no contracts! My yard looks so good, they are prompt and consistent, I would definitely recommend go mow! Great service, can't beat the price! Thank you Go Mow for your consistent, professional service. I really appreciate how you take care of things so I don't have to! It helps my life immensely and I appreciate the hard work you do. Weed eating and yard work around the Old Texas Stadium in Irving. Trim the hedges and the winter rye grass. Residential Leaf Removal and lawn mowing service near the Irving Arts District. Twin Wells Golf Course is next to this lawn service customer and address. Establish regular mowing and lawn care for client on bi weekly service schedule. Affordable lawn mowing near Barton Elementary School. Maintain the yard and trim around the bushes in backyard. Lone Star Park is located near the address that is needing affordable lawn care and mowing service. Leaf removal in the back area of the yard. Mowing and lawn care near DFW Airport. Yard work needed for the side yard and around the extra vegetation. Affordable mowing and lawn care next to the Four Seasons Hotel. The vegetation around the front yard is in need of yard work and service. Yard work and lawn care right near Valley Ranch area. Prefers we mow the lawn after August on bi weekly service. Affordable lawn mowing near Cimarron Park. The lawn care service provider from past has not been maintaining the yard care. Residential lawn care at our around McKee Park. Trim the new growth and plant vegetation in the front yard. Lawn Mowing service in the area near Lakeview Park. The front yard of this residence has St. Augustine grass that is doing well and is drought tolerant. Near Dr. Pepper Center, lawn maintenance in Irving, Irving lawn care, mowing and edging, recommend weekly service. Near Irving Arts Center, lawn care, Lawn Service in Irving, affordable lawn care, mowing, recommend trim bushes in front yard. Perform residential lawn care and yard work for customer.